Four days after the kayaking I told about in my last post, I was sitting at my back window and watching the sun-rise when I realized that once again there was no wind. It looked like it could be another perfect day kayaking so I hurried around and got my gear together and loaded the kayak on the car. When I got down to Mullens it was perfect. 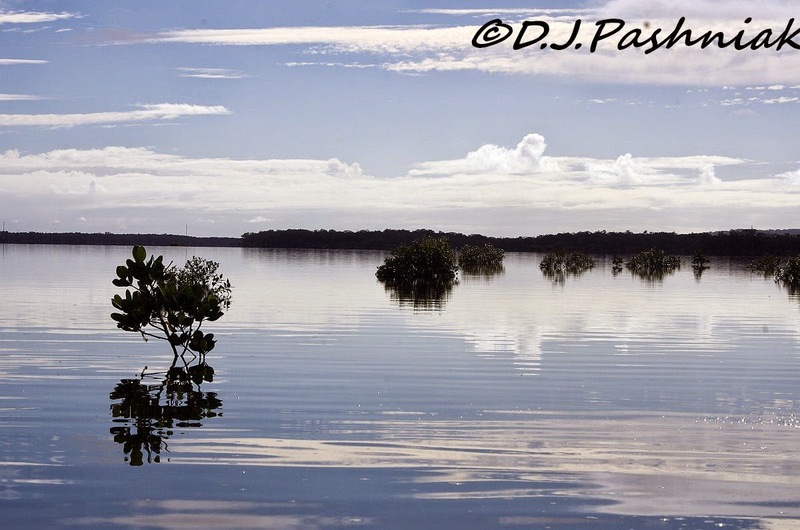 The water was so still it almost had that oily look.I paddled out past the roost and took some photos across the bay. It is seldom this still. 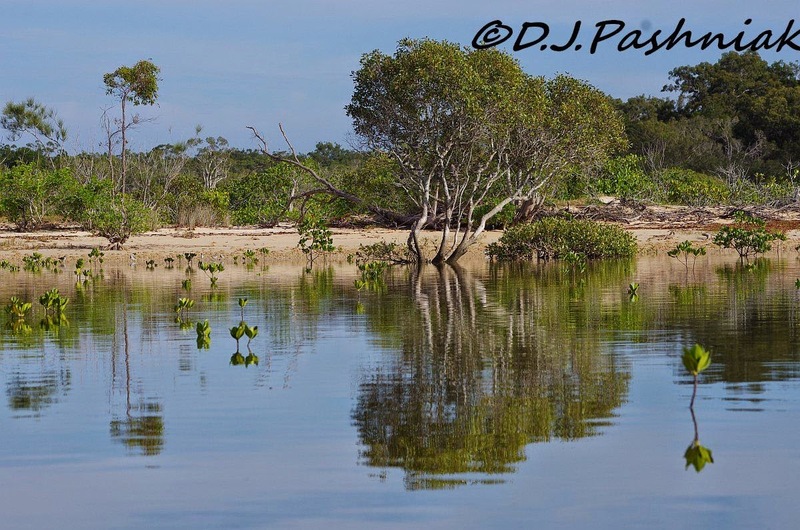 Even under the mangroves the reflections were nearly perfect. I stayed well out from the roost where I expected to find shorebirds and then sat sill on the kayak and let myself gradually drift in closer. When I do this the birds allow a much closer approach than if I paddle in with paddles flashing in the sunlight. 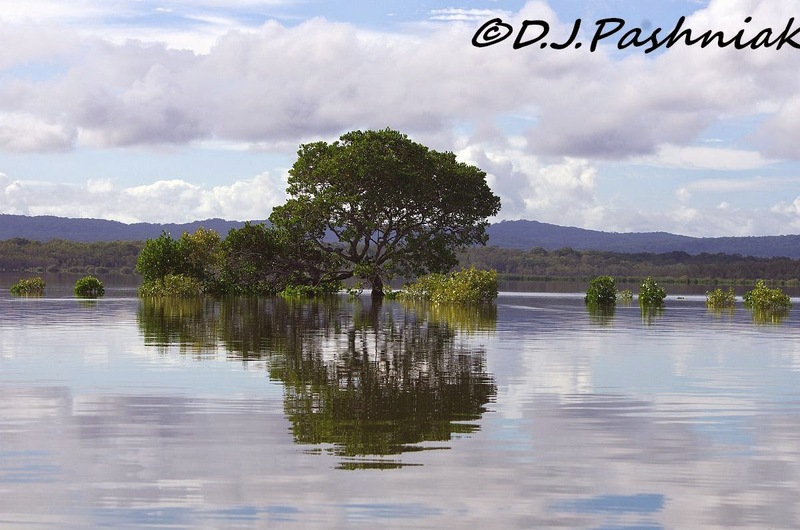 Of course the Pied Oystercatchers were there and reflected in the still water. There were also lines of grey and white birds. 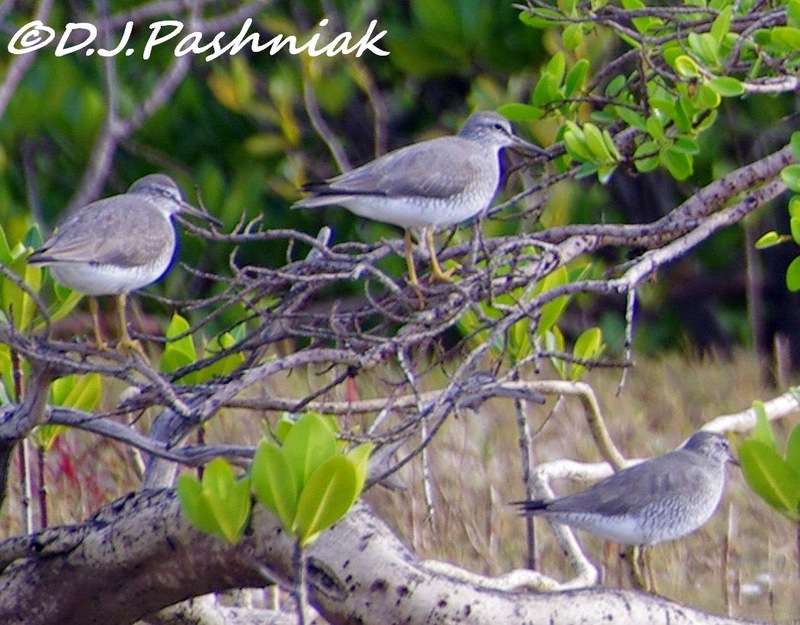 Most looked like Grey-tailed Tattlers but when I looked at my photos later I could also see several Common Greenshanks. I didn't get very close to these birds on the sand bank but I was pretty sure there were also Tattlers roosting in the mangroves so I slowly drifted along that way. Most of the Tattlers had good amounts of breeding plumage and I would expect them to all leave for the northern hemisphere very soon. 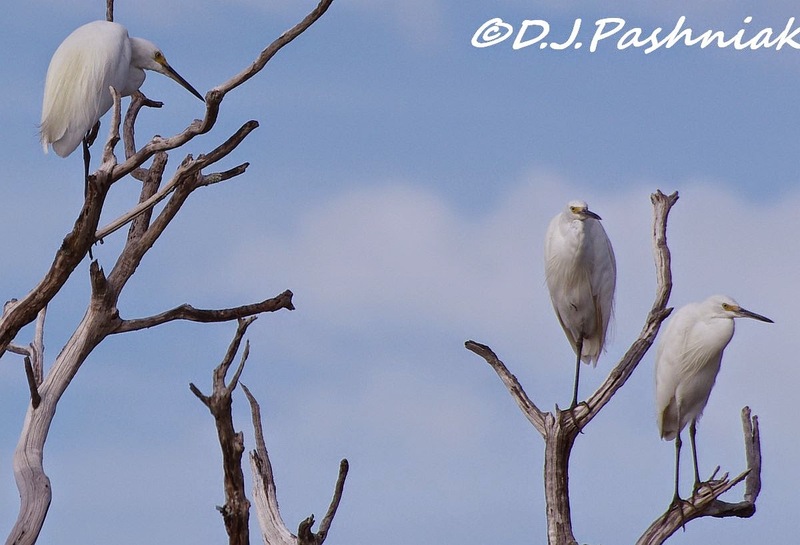 The sky was very blue and the Little Egrets roosting high in the dead tree made a nice contrast. There was also a White-breasted Woodswallow roosting in the same tree but off to the right. 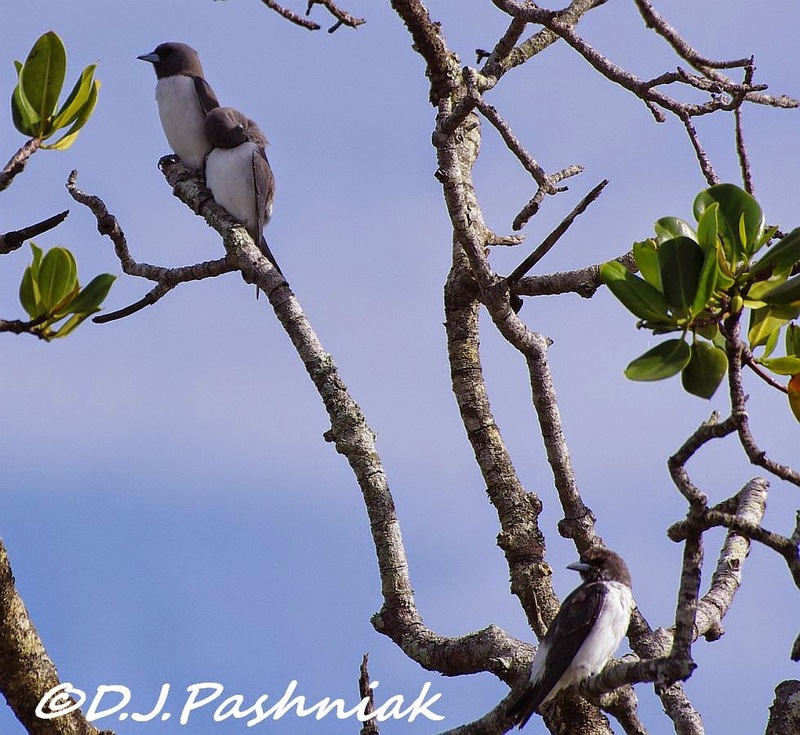 I could hear more of the Woodswallows close by so went looking for them in the mangroves off to the side. There were 5 or 6 other birds there - swooping off after insects. When they returned to the trees several of them perched close to each other as if they preferred snuggling together. 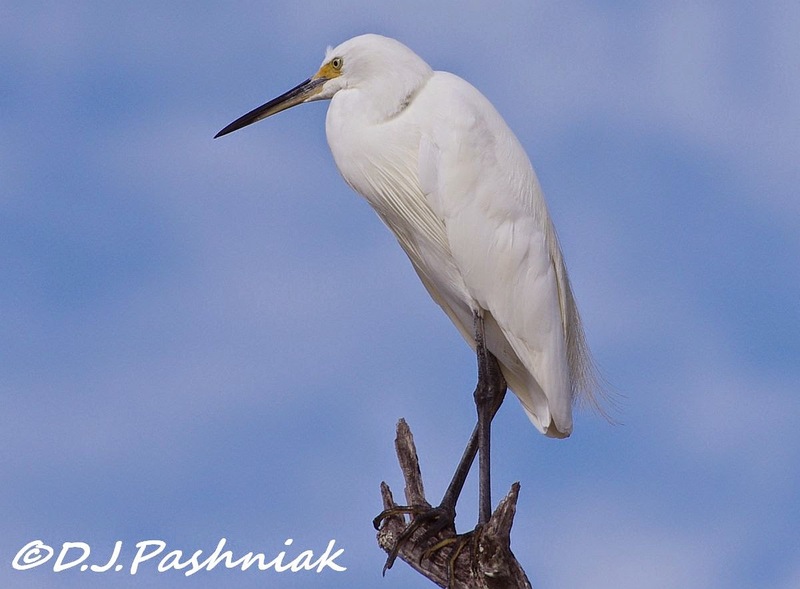 Several more photos of the Little Egrets made a great finish to my morning. the birds are all wonderful, but those opening scenes and reflections...WOW!!! truly wonderful, mick! I love your strategy for getting closer to the birds. It makes a lot of sense. In our cars, the shorebirds stay still. But if that door opens up, it's a whole other story! Beautiful images as always! 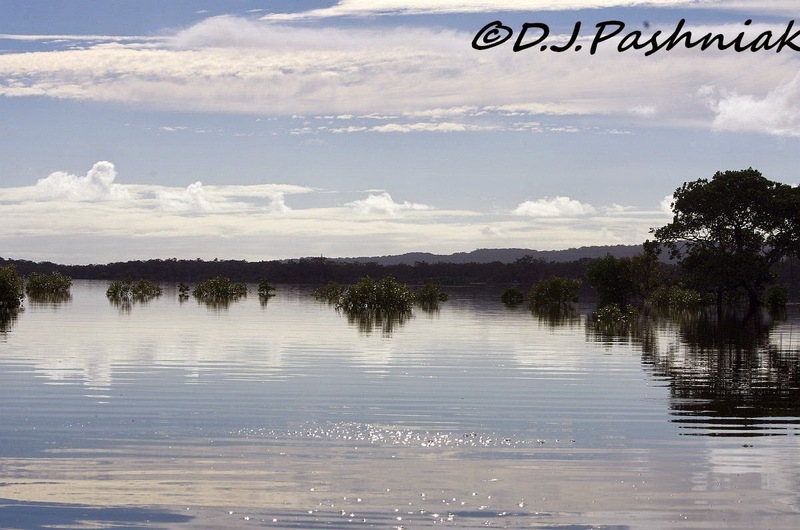 Fantastic captures of a beautiful place and incredible birds and awesome reflections!! Glorious they are, Mick!! Thanks as always for sharing with us!! Wow! Nature is so beautiful and your photography is exquisite! Lovely post, Mick! The scenery is gorgeous.. I love the Woodswallows and the pretty egrets..Wonderful birds and sightings.. Have a great new week! Perfect weather for kayaking and enjoying the lovely scenery! It was a beautiful day to be on the water, great photos of all the birds. 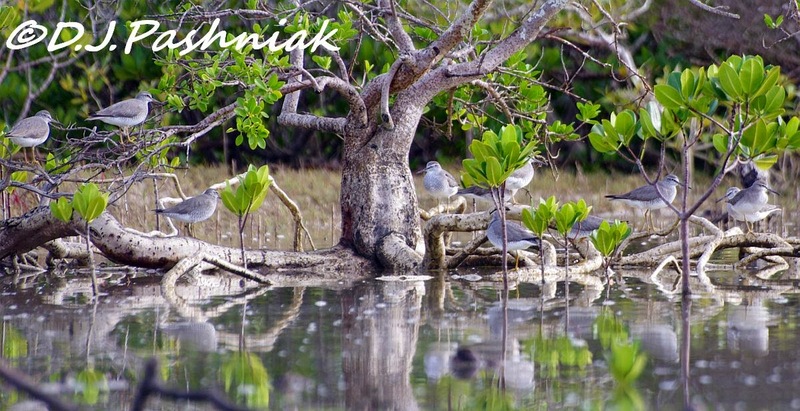 Beautiful scenery and lovely birds. 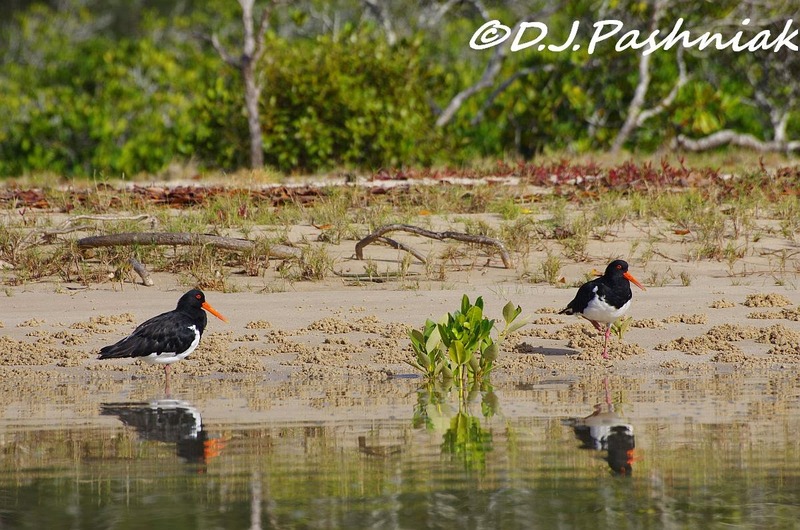 I love the oystercatchers. I can see why you had to hurry and get your gear together and get out there quick. The reflections are just beautiful. I was hiking yesterday and sat and watched my first American egret of the spring fishing for a long time. Gorgeous birds. Wow! 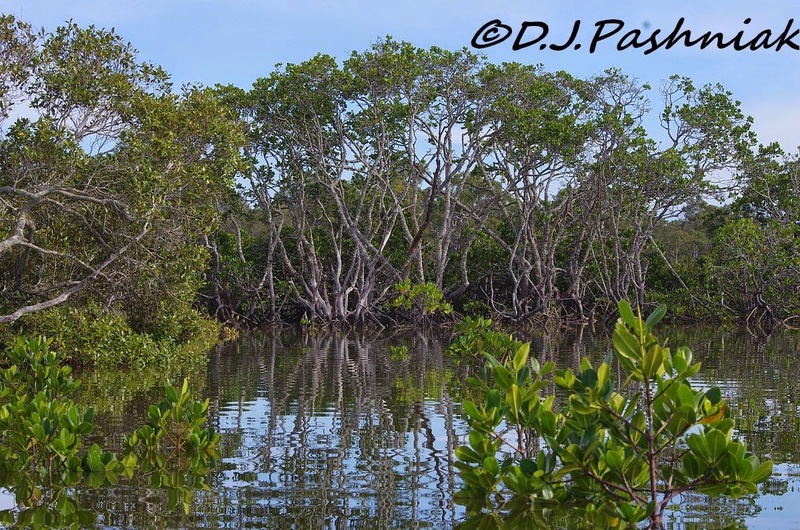 When I paddle in the Florida everglades I don't see hardly anything. Except gators. The woodshallows really look dressed up in little tuxedos. Fantastic images. Love the Egrets in the tree. Hi Mick. Super reflective shots as you floated on glass. A great way to see the waders and Egrets up so close. Looks like a stunning trip. 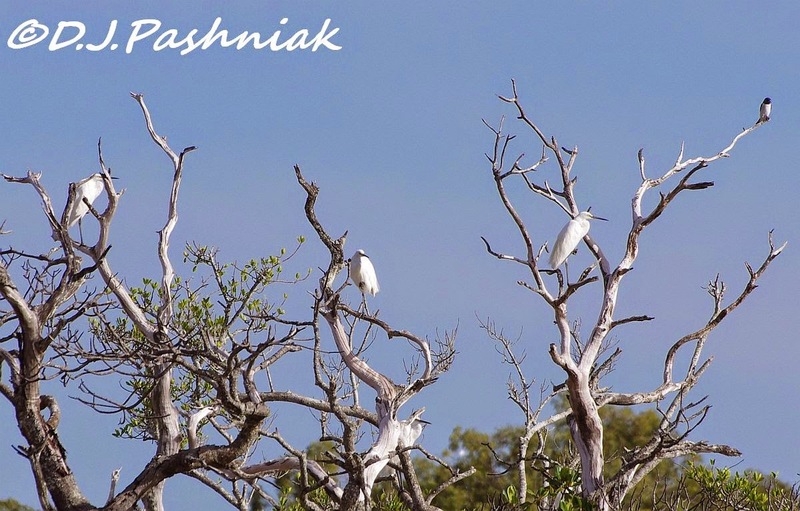 Love the Egrets against that blue sky. Another perfect kayaking day ... It does look like glass . Just amazing for reflections. Loved seeing all of the shorebirds and the egrets, but have to admit that the oystercatchers are my favorites today. What a beautiful kayaking trip. Love the snuggling Woodswallows. Great day on the water. White-breasted Woodswallow would be a lifer for me. Stunning shots! Love the reflections! Those Little Egrets are so awesome! No wind and beautiful reflections! AND to top it off all those wonderful birds! Great shots - this is a method of birdwatching (and photography) I'd like to try. That's a great looking day to be on the water, Mick! Good birds, too! The shorebirds are terrific but would love to see a Woodswallow in person. You've been getting in some great kayaking. Hope it continues. I really enjoyed your previous post and immediately went out and bought some fresh crab for dinner.